I'm going to duck marks for the sticky double sided 'thermal' tape AOpen use to hold on the rather neat looking aluminum active cooler. We personally prefer to use a good quality thermal compound or at the very least some white silicon thermal paste. As there are no mounting holes in the PCB for such a configuration it is evident why the double sided tape was used however. The VIA Apollo KT266A chipset is cooled by a spiffy looking active cooler with a less than ideal thermal interface. 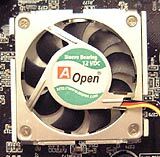 Aopen have just stuck the thing on top of the BGA chip. rounding out the other bits and pieces that the AK77 Plus offers users are optional Dr.Led, IrDA, WOM, WOL, AC power auto recovery (system reboots in event of loss of power automatically), chassis intrusion, font panel audio jumpers, double BIOS (optional) and two sets of extra USB ports - though only one connector is included. The bigger draws for us were the twin BIOS, and onboard sound by AD1885 chipset. It uses the AC'97 Codec so the sound quality is good enough for most mini computer speakers, but die-hard audiophiles will no doubt be looking to drop in a full-fledged audio card. The AGP 2.0 interface uses a nice little retention clip to lock the 4X AGP card solidly in place. To remove the card from the slot, simply press down on the little white lever and the rear part of the card will pop out. The Award BIOS that powers the AK77 Plus is really overclocking and tweak friendly. With lots of adjustments for memory, voltage and clock speeds it gives the user a good amount of breathing room for custom adjustments.Processor Adjustments are standard; CPU clock adjustments range from x5 - x12.5 and CPU FSB can dialed in upto 248MHz in 1MHz intervals. We played around with the settings for a while and were only able to garner a 1.80GHz overclock on the 1.60GHz Athlon 1900+.